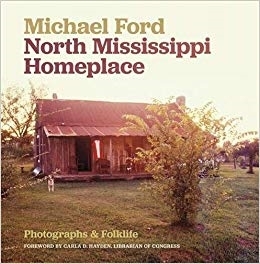 "A hauntingly beautiful collection of color photographs that capture the North Mississippi world that inspired the fiction of William Faulkner, the photographs of William Eggleston, the music of Othar Turner, and the metalwork of Marion Randolph Hall. Michael Ford’s keen eye documents people, their homes, and their landscape in exquisite detail, and his eloquent writing frames each image with loving care." A beautiful photojournalism essay spanning decades of southern life. In the early 1970s photographer and documentary filmmaker Michael Ford left graduate school and a college teaching position in Boston, Massachusetts, packed his young family into a van, and headed to rural Mississippi, where he spent the next four years recording everyday life through interviews, still photographs, and film. The project took him to Oxford (in Lafayette County), as well as to Marshall, Panola, and Tate Counties, to a remote area north of Sardis Lake. His efforts resulted in the award-winning documentary film Homeplace (1975), but none of the still photographs from this time were ever published. With this illustrated volume, those photographs are now available and offer a valuable window into the rural, local culture of northern Mississippi at that time. These moving photographs illustrate Ford’s experiences as an apprentice to blacksmith Marion Randolph Hall, his visits to Hal Waldrip's General Store in Chulahoma, a day spent with AG Newsom and his crew making molasses, and Othar Turner's barbecues accompanied by traditional fife-and-drum music. They also capture the evocative landscape of the Mississippi hill country and the everyday lives of its residents. In 2013 Ford returned to his adopted homeplace, camera in hand, only to find that most everything had changed—or was gone. This photo essay project juxtaposes the rural Mississippi of the 1970s and the mid-2010s with Ford’s personal reflections drawn from his journals, interviews, and archival notes.